What is your name and role within Los Master Plus? (Answering this is Alfredo Comanche). I am Comanche and I’m in charge of most of the stuff done in the band. I am the producer, I write the lyrics and music and I do live guitar and vocals. I also design most of the shirts we wear in the shows. 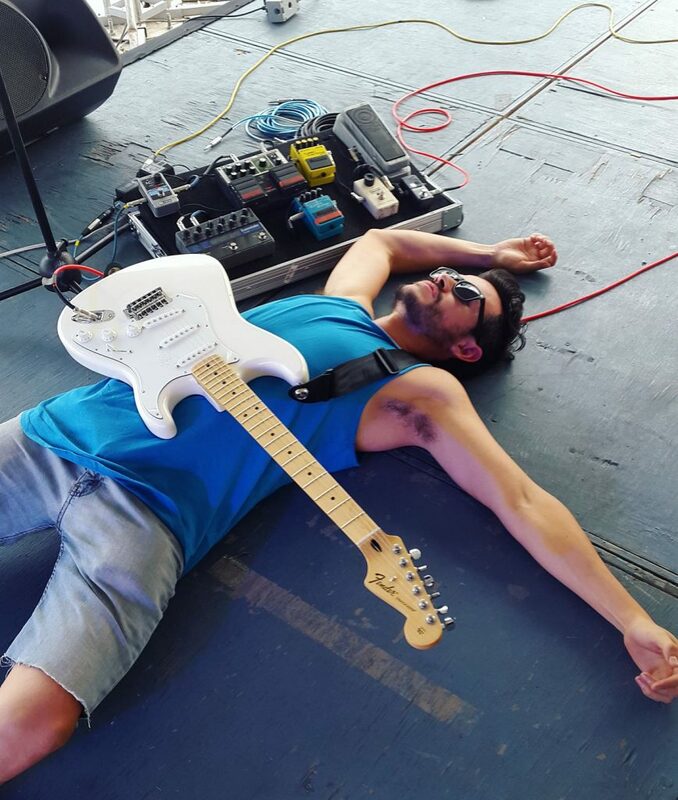 Los Master Plus started in 2010 with the idea of mixing mexican folk dance music with more modern stuff and genres from outside our country (hip-hop, electronic, rock). We have a very wide range of rythms and styles of music we like, so we decided not to choose one or two but to combine them all in a fun project that would allow us full creative freedom both in the studio and on stage. I started the band with Larry Mon who decided to leave the band last november since he’s not a musician and was having a hard time trying, but since it was all my idea we kept going with our drummer David ‘Black Diamond’ Muñoz who had played with us for 2 years already and with Alex “Nito” Luna who is a beast in the keyboards. Now the live show is better than ever. Fans were surprised Larry left as it usually happens, but they have been digging the new stuff and we’ve been getting lots of new fans too. This year has been awesome for the band. We live in Guadalajara, second largest city in Mexico located in the west coast and just 3 hrs from the beach. Beautiful weather, beautiful girls and delicious food. Perfect setting for making music. It varies a lot, sometimes we are practicing and since there’s a great vibe between us, someone will come up with and idea of adding something to the live show, maybe a phrase from a 50 year old mexican folk song into a cumbia cover of ‘Lady’ by Modjo followed by the sax riff from ‘Careless Whisper’. As far as writing songs it can strike you anywhere, you might get an idea in the morning shower or while driving or wake up at 3 am humming repeatedly something you came up with while trying to sleep so you race to get the phone to record it (This part is important so you don’t forget the melody or phrase. My phone is full of weird voice notes singing mainly riffs and progressions that aren’t always decipherable afterwards). Keyboards: Korg X5D, Nord Wave, Roland Lucina Midi Controller (pimped out, see pic). Guitar: Fender Stratocaster, Fender Deville, and my pedal rig you can see it in the pic attached. Drums: Weird set up, plays standing up (see pic). The free time we get we like to hang out with friends and family, sometimes you miss lots of important stuff because of work so you try to balance it out. We love traveling and luckily we get to do it a lot; and of course it influences the music (for example, the rythm in ‘Suave Leve’ came about while eating at a kebab joint in Toulouse, France; getting to know middle eastern rythms). My hobby is graphic design and designer friends laugh because I still use Corel Draw but I manage to design nice things for our merch and the shirts we wear on stage. We have a couple of genres we named. 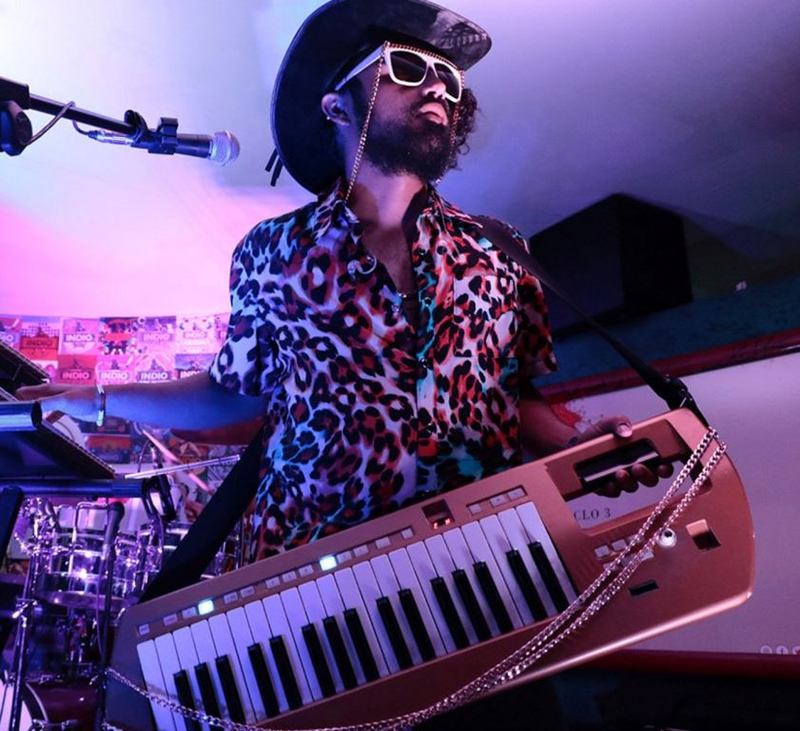 ‘Cumbiatronico’ is a mix of cumbia with electronic, and ‘Sabrosindie’ is a mixture of ‘sabroso’; which is a spanish word for danceable and tasty (musically speaking) and ‘indie’. As you can see in our live shows, the base of it all is cumbia. We love synth sounds and hip hop, so that happens a lot on record and live. It goes great with cumbia. Yes. The stuff we recorded in the early years might say otherwise (hehe) but back then we didn’t have a lot of resources (pentium pc, beat up headphones, borrowed mic) so we did what we could with what we came across and with the spare time we had since we had day jobs. We also wanted it to sound like that, kind of home made and one take style, since it started out kind of for fun. We did want to get out and play shows but we never imagined we’d play at SFMoMa or the Mayan Theatre or House of Blues in Las Vegas or a mansion in Beverly Hills or in Paris or Paraguay. Make more music! We want to play in Japan. When I was 8 I got a keyboard for Christmas and spent hours messing with and discovering the sound of all the instruments it had on there, but never really learned to play it. Later at 15 and learned guitar and got on the internet, downloading any music software I could get my hands on and my computer could run. Ondatrópica, A Chal, Caloncho, Chicano Batman, Cumbia Drive, P.Flxws. 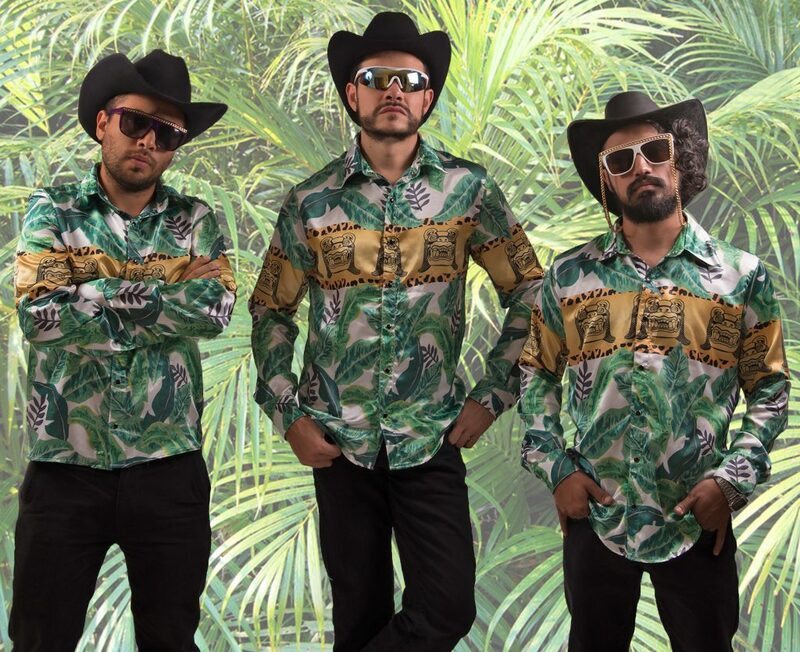 Banda El Mexicano, Fito Olivares, Pharrell, Mike Laure, Daft Punk. Currently we are on tour all over Mexico, clubs and festivals. We also have a festival coming up in Long Beach, California on october 1st called ‘Music Tastes Good’ with a cool international line up.